Shopping for the uber-stylish clotheshorse or design diva in your life can be a difficult mission fraught with angst. We’re here to help with some hot tips on what to buy this year. Metallic clutches are back in style this season. Two featured here include the bronze Cloves clutch from Aldo (B, $30, www.aldoaccessories.com) and the gold patent Starlet clutch from Kaia Peterka (G, $240, www.kaiapeterka.com). Designs by local Hilside Bags (E, $12 to $50, www.hilsidebags.com) offer a fantastic selection of ditty bags with vibrant cottons and silk on the outside and fun patterned oilcloth on the inside so no messes stain the interior. With seven sizes to choose from, finding the perfect bag’s a cinch. Marc Jacobs has created a pair of unisex aviator sunglasses for his Marc line (C, $95, www.marcjacobs.com) to please any fashion lover. Cara Lyndon’s delightful pink vintage Celluloid Rose earrings (D, $22, www.caralyndon.com) also make a great gift for those who love stylish and unique jewelry. Find ridiculously soft and warm cashmere sweaters for both men and women (A, $115 to $395, www.jcrew.com) at J.Crew in bright colors sure to chase away any winter blues. Or bundle up in a slimming and warm 650-fill down women’s Chevron jacket (F, $99.50, www.landsend.com) and cable-knit scarf set from Land’s End. Article published in The San Fransisco Chronicle’s “Holiday Gift Guide” custom publication on December 5, 2007. 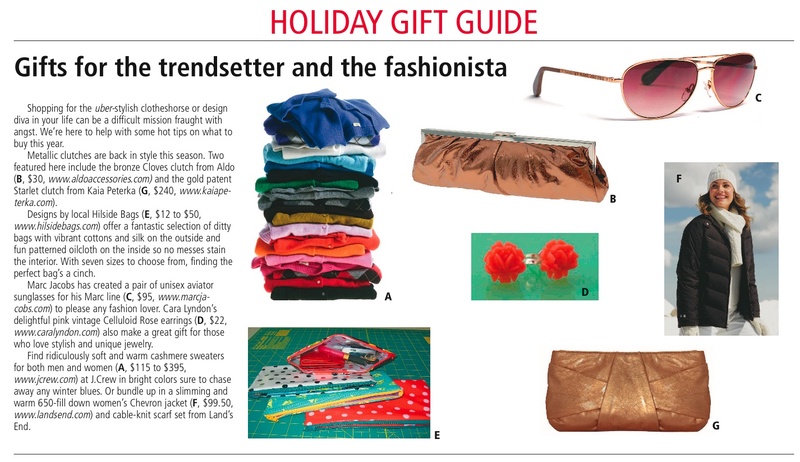 Download PDF of original article “Gifts for the trendsetter and the fashionista” to view full layout with PHOTOS!